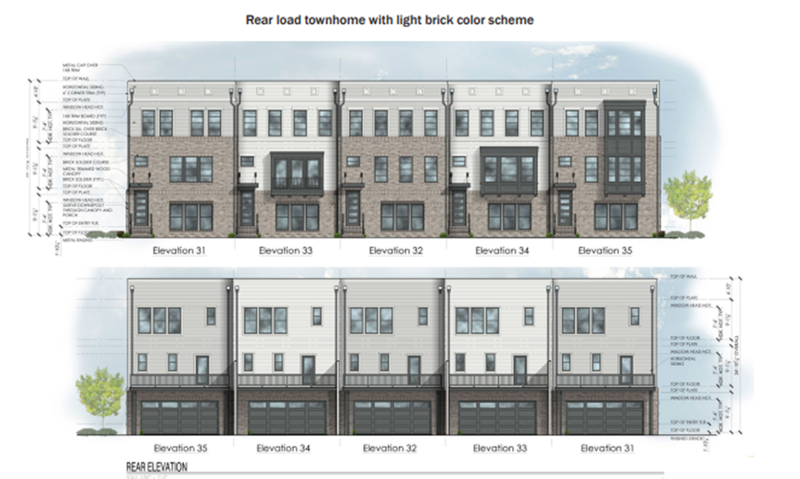 Architectural renderings of what the Stations at Fishers District townhomes may look like. 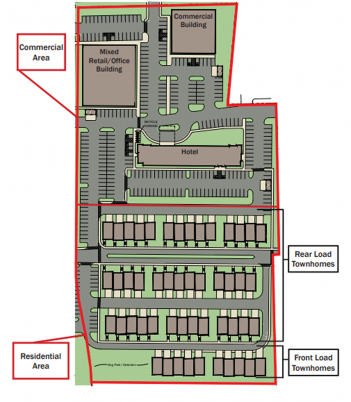 The Fishers Plan Commission unanimously forwarded the Stations at Fishers District to city council after hearing from the petitioners at its March 6 meeting. The Stations at Fishers District proposal was continued from the plan commission’s February meeting. Director of Planning and Zoning Tony Bagato presented on the 8.67-acre project. The project, at 9712 and 9799 E. 116th St., is east of the Yard at Fishers District. It was originally approved in 2017 under a different property owner. The property changed hands and is now owned by Thompson Thrift Retail Group, which also is developing The Yard at Fishers District. Bagato said although Thompson Thrift manages both properties, The Stations at Fishers District and The Yard at Fishers District are separate projects. Although The Yard at Fishers District is focused on culinary and restaurant developments, the Stations at Fishers District will feature retail, office and townhomes and a hotel. The project will create vehicular and pedestrian connectivity between The Yard at Fishers District and the Kroger grocery store to the west. After Bagato’s presentation, Steve Hardin, a partner with Faegre Baker Daniels, presented on the project. A dog park is planned for the townhome area, and Hardin said the location of the dog park and some landscape buffers may change if the hotel’s location changes. With the plan commission’s favorable recommendation, the Stations at Fishers District proposal was scheduled to go before the March 18 Fishers City Council meeting. Results of that meeting were unable to be included in this story because of press deadlines. For more, visit fishers.in.us.